Stupidity has me on speed dial. And mornings are not my strong suit. Deprive me of caffeine, and what may start out as a barely functional morning can then trail off very badly. Routinely parking opposite the post office one morning on the way into work, I emptied our post office box and filtered out the junk mail. There were quite a few unsolicited mail items on this particular morning so I lingered there for a few extra moments. I then re-posted the unwanted items (is this wrong?) so the post office sorters could re-offer these items to other irritated PO box customers. Having meandered absently down the ramp from the post office, thinking only of ridiculously strong coffee, I then started to cross the road to where my car wasn’t parked anymore. Stupidity requires that you absorb critical data slowly. I stopped dead in my tracks, did a double take, retraced my movements, and still came up with the same result. But something had been tugging at me whilst I was walking down the ramp; where something familiar but somehow out of place had moved through my field of vision. I now knew what it was. I ran faster and more frantically than I have ever run in my whole life. My car was about 50 metres (150 feet) down the road, drifting silently backwards into a very busy “T” intersection, tracking a perfect path toward a power pole on the other side. It wan’t travelling fast, a bit less than walking speed, but it was an odyssey promising disaster. The total traffic anarchy was profound. Cars screeched, swerved, pulled over or rapidly or reversed out of the way; whilst stunned and bewildered pedestrians, open mouthed, watched as a complete idiot wildly chased after his car. It was sheer madness. I covered the distance to my car in Olympic time. 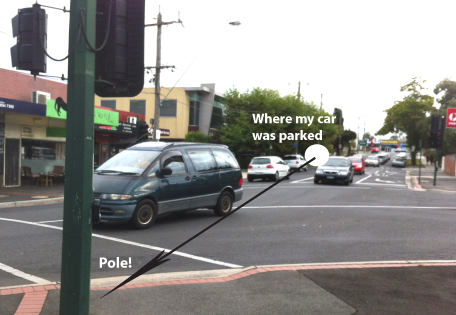 With the car now well beyond the centre of the intersection and only metres from the power pole, I wrestled with the driver’s side door but it was locked. Of course it was locked! I had forgotten to put the car in “park” and engage the handbrake, but I had remembered to lock it! Doing the maths, I figured there were only 3-4 seconds left before impact. Scrambling around in my pocket, while dancing sideways so I remained in line with the driver’s door, I frantically dug out my keys. Now in the final stages of adrenalin driven hysteria, and still dancing like I was putting out a bush-fire, I stabbed madly at the key fob … and successfully unlocked the rear hatch! There were maybe 2 seconds left, one last chance. I squeezed the other end of the key fob, and finally the doors unlocked. I lurched into the car in the most unflattering jerking motion imaginable, all arms and legs, and stamped on the brakes. My whole being had transformed into one big single raging pulse. My ears were pounding. I started the car and rapidly cleared the scene, stopping at the next set of traffic lights 150 metres (400 feet) up the road. Exhaling and trying to calm myself, I prepared for the immediate onset of denial. Relieved that I hadn’t caused a major traffic accident, I could now move on and instantly forget just how stupid I had been. But there was now a complication behind me, expanding in my rear view mirror. A car was moving up from behind that I quickly recognised as being the first on the scene at the intersection and one that had swerved severely out of the way. I was hoping this driver would stop behind me so I could avoid confrontation, but to my horror it moved alongside me and the passenger-side window started lowering. I was now preparing myself for one almighty verbal spray. I lowered my window down as well, to take my punishment. The driver, a male in his forties, was shaking uncontrollably in his seat, and screaming with laughter. He tried to speak but all he could do was shake his head. He ran out of breath and starts choking. He may have even soiled himself. We didn’t speak at all, just laughed. This guy was now going to own the water cooler conversation at the office, but only after he quickly ducked back home and changed his pants. I now drive a car that won’t turn off unless the car is in “park”, but frankly, I’d prefer one that makes strong coffee. This entry was posted in Humor and tagged australian, humor. Bookmark the permalink. 9 Responses to My car drove off without me! I’m laughing at your expense. Great story! Glad you and your car were unscathed. Thankyou! It’s good to laugh, even if it is at your own expense! I just shake my head whenever I drive down that street. Thanks for reading! Very entertaining, thrillingly written. Good yarn. May I suggest one, no, two changes. First line, drop the ‘’e’’ from suit and could you please put the ‘’s’’ back on the end of ‘mathS’. Immediately! Thanks mate. Done,thanks! It’s great to have a fact checker! Thankyou! I’m enjoying writing them! Only just started this blogging thing so there is plenty more to come. Great story. My Mum did that once except I was still in it. Luckily, even as a 4 year old, I guessed putting on the hand brake was the thing to do. Wow. how I felt is only a fraction of what Poor Gloria must have been going through. A very sharp young lady getting to the handbrake too!